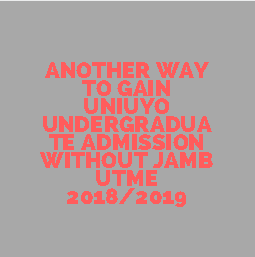 There is an easier and less tedious way to gain admission into the university of Uyo full time Undergraduate Programme Without Jamb Utme. This alternative way is a good back up Programme for all Jambites just Incase your Admission through Jamb Utme didn’t go through then you can fall back to this alternative Programme. The application form for this Programme is currently on sale and all that is required for you to apply is just your olevel grade(Awaiting Results Will Also Be Able To Apply). This Programme is known as the UNIUYO basic Programme or UNIUYO Jupeb Programme. The Basic Programme is open to all courses without limitation. The 2018/2019 UNIUYO Basic Programme Application Form is on sale. You need to get ready for that too even as you prepared for the 2018 post Utme. Those that didn’t take 2018 Jamb Utme will also be able to apply too. You don’t need Utme for this Programme whatsoever. There will be an Entrance exam; After sales of application form there will be an exam for all applicants. Start preparing for that Entrance exam right now to stand a good chance of success. whats the price range of the basic program sch fees? after the program, will they be given Jupeb certificate? Please Sir Like How Many Should I Score To Gain Admission To Study Medicine? Are they not doing the program there….???? Please Sir,for those applying for medicine and surgery,what are they expected to score in the Basic Studies Programme screening? Hi sir,I scored 207 in jamb,my waec is good,would I have admission to study medicine?